Russian engineer cosmonaut 1992-on. 546 cumulative days in space. Civilian Engineer, Energia NPO. Status: Active 1992-on. Born: 1953-08-31. Spaceflights: 3 . Total time in space: 546.94 days. Birth Place: Magadan. PERSONAL DATA: Married to Vinogradova (nee Zakharova) Irina Valentinovna. They have one child. His mother, Lydia Safronovna Vinogradova, resides in Tambov, Russia. EDUCATION: Graduated from high school # 1 in Anadyr' in 1970. He won many awards at city school competitions in physics and mathematics. In 1971 he entered the Moscow Aviation Institute (the MAI), the Aircraft Department, which he graduated from in 1977 as a mechanical engineer specializing in aircraft production. In 1980 he graduated from the Aircraft Automated Designing Systems Department of the MAI as a computer system analyst. EXPERIENCE: Prior to entering the MAI from September 1970 he worked at the Red October machine-building plant as a metal turner intern and from October 1970 to April 1971 as a 2nd Class metal turner. From September 1971 to March 1977 as the MAI student he worked at the Iskra Student Design Bureau, as well as a senior lab assistant at one of the MAI chairs and ONIL Laboratory. From April 1977 he worked at the Aircraft Automated Designing Systems departmental laboratory as an engineer and from May 1978 to August 1983 as a senior engineer. He specialized in software development for automated interactive designing systems of recoverable spacecraft (KLAMI), development of aircraft aerodynamics and configuration, computer graphics. At the same time he worked at the Institute of Biomedical Problems (the IBMP) as a part-time test-subject, participating in various tests of the Buran Program. From August 1983 he worked at the Energia Russian Space Corporation as an engineer, senior engineer, leading engineer and work group lead. In November 1989 he was assigned to the position of a division head of the 272nd Department at the Chief Design Bureau, where he worked on flight procedure verification for the Soyuz transport vehicle/Buran orbiter crews and development of automated crew training systems. He supported launch preparation of the Soyuz TM transport vehicle, Buran obiter and Energia booster; worked on the Buran orbiter docking mechanism issues. In 1985 he participated in the Buran training of flight engineers including Valentin Lebedev, Alexander Ivanchenkov, Gennady Strekalov, Alexander Balandin, Alexander Laveikin and Musa Manarov. In February 2003 by the order of the Energia RSC President he was assigned to the position of the 291st Department Chief, retaining the position of a cosmonaut instructor/test cosmonaut and became the Energia RSC Cosmonaut Corps commander. By the order of the Energia RSC President as of 30 October 2007, Vinogradov was retired from the position of the Energia RSC Cosmonaut Corps and assigned to the position of Deputy Chief of Flight Space Center. On 26 April 2010 at the Interdepartmental Board meeting for selection and assigning cosmonauts to vehicle and station crews Vinogradov was certified as a cosmonaut of the Energia RSC Cosmonaut Corps. He has logged 11 flight hours piloting the L-39 training aircraft and performed 29 parachute jumps. SPACEFLIGHT TRAINING: In May 1992 Vinogradov was enlisted to the Energia RSC Cosmonaut Corps as a cosmonaut candidate. From October 1992 to February 1994 he took the basic training course at the Gagarin Cosmonaut Training Center. Following successful evaluation he was certified as a test-cosmonaut. From May 1994 he has been completing advanced test-cosmonaut training. In May 1995 was assigned to the position of a test-cosmonaut of the 291st Department at the Energia RSC. From 20 February to 3 September 1995 he trained as a Flight Engineer of the Mir-20 and EuroMir-95 backup crew to fly onboard the Soyuz to the Mir Orbital Complex. From October 1995 to August 1996 he was in training for spaceflight onboard the Soyuz TM to the Mir OC as a Flight Engineer under the Mir-22/NASA-3 and Cassiopeia programs. From August 1996 to August 1997 Vinogradov trained as a flight engineer of the Mir-24 prime crew. From March 1998 to February 1999 was in training for the ISS-3 and ISS-5 missions. By the decision of the Russian Space Agency Panel, though, Vinogradov was withdrawn from the ISS crew team and assigned to the Mir-28 Expedition as a backup crew flight engineer and to the Mir-29 Expedition as a prime crew flight engineer. From March 1999 to March 2000 he was in training as the Mir-28 Expedition backup crew flight engineer. From June 2000 he trained as the Mir-29 Expedition prime crew flight engineer, but in December 2000 was withdrawn from training because of the Mir Orbital Complex transfer to the unmanned flight status. In January 2001 he was assigned to a spaceflight to the Mir OC in the event of off-nominal situations onboard as a backup crew flight engineer. In November 2002 he started training as the ISS-5 backup crew commander, but in January 2003 the GMK Chief Medical Board suspended him. From January 2004 to October 2005 he was in training as the Soyuz TMA and ISS commander. From October 2005 to March 2006 he was in training as the ISS-13 prime crew commander. From February 2011 was in training for spaceflight as the ISS-33/34 backup crew flight engineers and the Soyuz TMA-M commander. 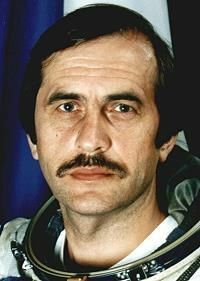 SPACEFLIGHT EXPERIENCE: In May 1992 Vinogradov was enlisted to the Energia RSC Cosmonaut Corps as a cosmonaut candidate. From October 1992 to February 1994 he took the basic training course at the Gagarin Cosmonaut Training Center. Following successful evaluation he was certified as a test-cosmonaut. During this expedition the damaged Spektr module was repaired and the Pegasus French biomedical program accomplished. In one of EVAs a solar array section of the Mir Orbital Complex that stayed exposed to space environment was disassembled and sent to the ground for further study of space environment impact. Vinogradov has logged 197 days in space during this flight, including a total of 25 hours and 19 minutes of EVA in five spacewalks. The second spaceflight of P.V. Vinogradov lasted from 30 March to 29 September 2006; he flew as the Soyuz TMA-8 and ISS-13 commander. During this flight he has logged 182 days in space, including a total of 6 hours and 31 minutes in one spacewalk. A veteran of two spaceflights, Pavel Vinogradov has logged a total of 380 days in space including 31 hours and 41 minutes in six spacewalks. ORGANIZATIONS: Vice-President of the Russian Federation of Cosmonautics. SPECIAL HONOURS AND AWARDS: Hero of the Russian Federation, Gold Star Award (1988); Pilot-Cosmonaut of the Russian Federation Award; For Merit to the Fatherland Order, 4th Class; For Merit in Space Exploration Medal; NASA Space Flight Medals. HOBBIES: Sports, aviation and cosmonautics history, astronomy. Family: Cosmonaut. Country: Russia. Spacecraft: ISS, Mir. Flights: Soyuz TM-22, Soyuz TM-26, Soyuz TM-30, Soyuz TMA-8, Soyuz TMA-08M. Agency: Korolev bureau. Bibliography: 4452, 6153. 1953 August 31 - . Birth of Pavel Vladimirovich Vinogradov - . Nation: Russia. Related Persons: Vinogradov. Russian engineer cosmonaut 1992-on. 546 cumulative days in space. Civilian Engineer, Energia NPO. 3 spaceflights, 546.9 days in space. Flew to orbit on Soyuz TM-26 (1997), Soyuz TMA-8, Soyuz TMA-08M..
1992 March 3 - . Energia Engineer Cosmonaut Training Group 11 selected. - . Nation: Russia. Related Persons: Lazutkin, Treshchev, Vinogradov. 1997 August 5 - . 15:35 GMT - . Launch Site: Baikonur. Launch Complex: Baikonur LC1. LV Family: R-7. Launch Vehicle: Soyuz-U-PVB. Soyuz TM-26 - . Call Sign: Rodnik. Crew: Solovyov, Vinogradov. Backup Crew: Avdeyev, Padalka. Payload: Soyuz TM s/n 75. Mass: 7,250 kg (15,980 lb). Nation: Russia. Agency: RAKA. Manufacturer: Korolev bureau. Program: Mir. Class: Manned. Type: Manned spacecraft. Flight: Soyuz TM-25, Soyuz TM-26, STS-84 Mir NASA-4. Spacecraft Bus: Soyuz. Spacecraft: Soyuz TM. Duration: 197.73 days. Decay Date: 1998-02-19 . USAF Sat Cat: 24886 . COSPAR: 1997-038A. Apogee: 385 km (239 mi). Perigee: 378 km (234 mi). Inclination: 51.70 deg. Period: 92.20 min. Mir Expedition EO-24. The Soyuz docked manually at 17:02 GMT August 7. Over the next six months the crew undertook seven internal and external spacewalks to repair the crippled space station..
1997 August 22 - . 11:14 GMT - . EVA Mir EO-24-1 - . Crew: Solovyov, Vinogradov. EVA Duration: 0.14 days. Nation: Russia. Related Persons: Solovyov, Vinogradov. Program: Mir. Class: Manned. Type: Manned space station. Flight: Soyuz TM-26, STS-84 Mir NASA-4. Spacecraft: Mir. Internal Vehicular Activity. Connected Spektr power cables. Surveyed interior of depressurised Spektr module. Retrieved equipment and belongings from module..
1997 October 20 - . 09:40 GMT - . EVA Mir EO-24-3 - . Crew: Solovyov, Vinogradov. EVA Duration: 0.28 days. Nation: Russia. Related Persons: Solovyov, Vinogradov. Program: Mir. Class: Manned. Type: Manned space station. Flight: Soyuz TM-26, STS-86 Mir NASA-5. Spacecraft: Mir. Internal Vehicular Activity. Installed new hatch to reconnect Spektr solar array cable with Mir power bus..
1997 November 3 - . 03:32 GMT - . EVA Mir EO-24-4 - . Crew: Solovyov, Vinogradov. EVA Duration: 0.25 days. Nation: Russia. Related Persons: Solovyov, Vinogradov. Program: Mir. Class: Manned. Type: Manned space station. Flight: Soyuz TM-26, STS-86 Mir NASA-5. Spacecraft: Mir. Removed solar array from Kvant module..
1997 November 6 - . 00:12 GMT - . EVA Mir EO-24-5 - . Crew: Solovyov, Vinogradov. EVA Duration: 0.26 days. Nation: Russia. Related Persons: Solovyov, Vinogradov. Program: Mir. Class: Manned. Type: Manned space station. Flight: Soyuz TM-26, STS-86 Mir NASA-5. Spacecraft: Mir. Installed solar array..
1998 January 9 - . 23:08 GMT - . EVA Mir EO-24-6 - . Crew: Solovyov, Vinogradov. EVA Duration: 0.13 days. Nation: Russia. Related Persons: Solovyov, Vinogradov. Program: Mir. Class: Manned. Type: Manned space station. Flight: Soyuz TM-26, STS-86 Mir NASA-5. Spacecraft: Mir. Recovered equipment; began repairs on leaky Kvant-2 airlock. Examination of airlock indicated cause was loose belt, resulting in 10 mm gap..
1998 February 19 - . Landing of Soyuz TM-26 - . Return Crew: Eyharts, Solovyov, Vinogradov. Nation: Russia. Related Persons: Eyharts, Solovyov, Vinogradov. Program: Mir. Flight: Soyuz TM-26, Soyuz TM-27, Soyuz TM-27 Mir Pegase, STS-89 Mir NASA-6. Solovyov and Vinogradov together with French astronaut Eyharts (launched aboard Soyuz TM-27) undocked from the forward port on Mir at 05:52 GMT on February 19, 1998, fired their deorbit engines at 08:16 GMT and landed in Kazakstan at 50 deg 11 N, 67 deg 31 E at 09:10 GMT. 2006 March 3 - . 2006 March 10 - . 2006 March 17 - . 2006 March 24 - . 2006 March 30 - . 2006 March 30 - . 02:30 GMT - . Launch Site: Baikonur. Launch Complex: Baikonur LC1. LV Family: R-7. Launch Vehicle: Soyuz-FG. Soyuz TMA-8 - . Call Sign: Carat. Crew: Pontes, Vinogradov, Williams, Jeffrey. Return Crew: Ansari, Vinogradov, Williams, Jeffrey. Payload: Soyuz TMA s/n 218. Mass: 7,250 kg (15,980 lb). Nation: Russia. Related Persons: Ansari, Pontes, Vinogradov, Williams, Jeffrey. Agency: NASA, RAKA. Manufacturer: Korolev bureau. Program: ISS. Class: Manned. Type: Manned spacecraft. Flight: Soyuz TMA-7, Soyuz TMA-8, Soyuz TMA-8 ISS EP-10. Spacecraft Bus: Soyuz. Spacecraft: Soyuz TMA. Duration: 182.95 days. Decay Date: 2006-09-29 . USAF Sat Cat: 28996 . COSPAR: 2006-009A. Apogee: 349 km (216 mi). Perigee: 336 km (208 mi). Inclination: 51.60 deg. Period: 91.40 min. Soyuz TMA-8 docked with the Zarya nadir port of the ISS at 04:19 GMT on April 1. It undocked from Zarya on 28 September at 21:53 GMT, with the return crew of Vinogradov, Williams and space tourist Ansari aboard. It landed in Kazakhstan at 01:13 GMT on 29 September. 2006 April 1 - . 2006 April 6 - . 2006 April 7 - . 2006 April 14 - . 2006 April 21 - . 2006 April 24 - . 2006 April 26 - . 2006 April 28 - . 2006 May 5 - . 2006 May 12 - . 2006 May 19 - . 2006 May 26 - . 2006 June 2 - . 2006 June 2 - . 23:48 GMT - . EVA ISS EO-13-1 - . Crew: Vinogradov, Williams, Jeffrey. EVA Duration: 0.29 days. Nation: USA. Related Persons: Vinogradov, Williams, Jeffrey. Program: ISS. Flight: Soyuz TMA-8. The Expedition 13 crew wore Russian Orlan suits and exited the station through the Pirs module hatch, which was opened at 22:48 GMT. On the Zvezda module, the crew installed a vent valve for the Elektron oxygen system, cleared an obstruction on the WAL-2 antenna, and retrieved the Kromka and Biorisk experiments. On the station truss, they replaced a camera on the Mobile Base System. 2006 June 9 - . 2006 June 16 - . 2006 June 23 - . 2006 June 24 - . 2006 June 26 - . 2006 June 30 - . 2006 July 22 - . 2006 July 28 - . 2006 August 4 - . 2006 August 11 - . 2006 August 18 - . 2006 August 25 - . 2006 September 2 - . 2006 September 9 - . 2006 September 10 - . 2006 September 13 - . 2006 September 14 - . 2006 September 15 - . 2006 September 16 - . 2006 September 17 - . 2006 September 18 - . STS-115 MCC Status Report #18 - . Nation: USA. Related Persons: Ansari, Burbank, Ferguson, Jett, Lopez-Alegria, MacLean, Reiter, Stefanyshyn-Piper, Tanner, Tyurin, Vinogradov, Williams, Jeffrey. Program: ISS. Flight: Soyuz TMA-8, Soyuz TMA-9, STS-115, STS-121 Astrolab. 2006 September 19 - . 2006 September 20 - . 2006 September 23 - . 2006 September 28 - . International Space Station Status Report: SS06-042 - . Nation: USA. Related Persons: Ansari, Lopez-Alegria, Reiter, Tyurin, Vinogradov, Williams, Jeffrey. Program: ISS. Flight: Soyuz TMA-8, Soyuz TMA-9, STS-115, STS-121, STS-121 Astrolab. 2006 September 29 - . 01:13 GMT - . Landing of Soyuz TMA-8 - . Return Crew: Ansari, Vinogradov, Williams, Jeffrey. Nation: Russia. Related Persons: Ansari, Vinogradov, Williams, Jeffrey. Program: ISS. Flight: Soyuz TMA-8, Soyuz TMA-9 ISS EP-11. 2012 October 23 - . 10:51 GMT - . Launch Site: Baikonur. Launch Complex: Baikonur LC31. LV Family: R-7. Launch Vehicle: Soyuz-FG. Soyuz TMA-06M - . Call Sign: Kazbek. Crew: Ford, Kevin, Novitskiy, Tarelkin. Backup Crew: Cassidy, Misurkin, Vinogradov. Payload: ISS-32S. Soyuz TMA s/n 707. Mass: 7,200 kg (15,800 lb). Nation: Russia. Program: ISS. Class: Manned. Type: Manned spacecraft. Flight: Soyuz TMA-06M. Spacecraft Bus: Soyuz. Spacecraft: Soyuz TMA. Duration: 143.68 days. Decay Date: 2013-03-16 . USAF Sat Cat: 38871 . COSPAR: 2012-058A. Apogee: 422 km (262 mi). Perigee: 401 km (249 mi). Inclination: 51.60 deg. Period: 92.80 min. Docked with the Poisk module of the ISS at 12:29 GMT on 25 October. Undocked at 23:43 GMT on 15 March 2013. Retrofire at 02:13 GMT the next day,followed by landing in Kazakhstan at about 03:06 GMT on 16 March..
2013 March 28 - . 20:43 GMT - . Launch Site: Baikonur. Launch Complex: Baikonur LC1. LV Family: R-7. Launch Vehicle: Soyuz-FG. Soyuz TMA-08M - . Call Sign: Karat. Crew: Cassidy, Misurkin, Vinogradov. Backup Crew: Hopkins, Kotov, Ryazansky. Payload: Soyuz TMA s/n 708. Mass: 7,200 kg (15,800 lb). Nation: Russia. Program: ISS. Class: Manned. Type: Manned spacecraft. Flight: Soyuz TMA-08M. Spacecraft Bus: Soyuz. Spacecraft: Soyuz TMA. Duration: 166.26 days. Decay Date: 2013-09-11 . USAF Sat Cat: 39125 . COSPAR: 2013-013A. Apogee: 421 km (261 mi). Perigee: 409 km (254 mi). Inclination: 51.65 deg. Period: 92.88 min. Docked with the Poisk module of the ISS at 02:28 GMT on 29 March. Soyuz TMA-08M undocked from the ISS and made its deorbit burn at 02:05 GMT. The BO and PAO modules were jettisoned at 02:32 GMT and the SA descent module containing Vinogradov, Misurkin and Cassidy touched down safely in Kazakhstan at 02:58 GMT after 166.3 days in space. 2013 April 19 - . EVA ISS EO-35-1 - . Crew: Romanenko, Roman, Vinogradov. EVA Duration: 0.28 days. Nation: Russia. Program: ISS. Flight: Soyuz TMA-08M. Exited from Pirs module of ISS. Installed Ostanovka experiment on Zvezda module; returned external exposure experimental panels to the station (Vinogradov lost his grip on one panel, which floated off into space and was not returend)..